Web page optimization Virginia Beach | VISIONEFX provides on-going organic search engine optimization that attracts online leads and new projects for Coastal Custom Painting. 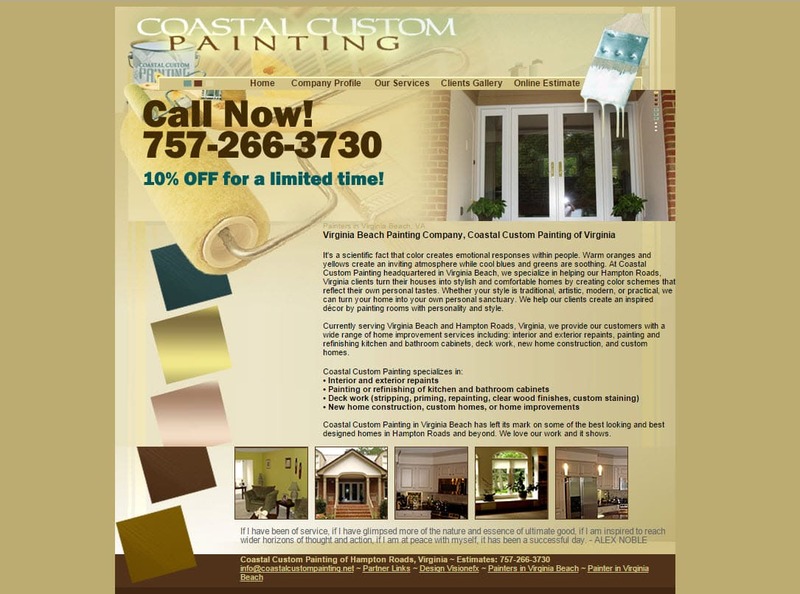 Coastal Custom painting enjoys a study flow of painting inquiries thanks to the unique organic search engine optimization developed by VISIONEFX coders. Coastal Custom Painting is located in Virginia Beach, VA.
VISIONEFX, is a Web design company based in Virginia Beach, VA. We provide extraordinary web design for small and large businesses throughout the United States to include; custom web design, web development, e-commerce web design, Word Press web design, Joomla web development, SEO and web maintenance services. Call: (757) 619-6456 or email info@visionefx.net.